Discussion in 'Water Cooling' started by Hakaba, Oct 8, 2018. Just saw these came out a week or two ago. Any one try them out yet? Still haven’t picked up the HWL GTS yet and wonder if it would be worth trying out the XSPC 20mm. It's funny how much they look like AIO radiators when they are that thin. I'd imagine you wouldn't lose much performance over a thicker rad, as swept area is generally much more important than thickness, but I have nothing specific to base that off of for these particular radiators. Rads of that style are optimized for air flow rather than air pressure. They usually need far less air pressure to drive air through them and can leverage higher flow (but lower pressure) fans. As for dissipating power, they will be less than the thicker ones (let's face it more tubes & fins dissipates more heat - more is better) but they are a lot easier to find a home for inside the case than thick rads. You would want to have a slightly lower water flow through them so the coolant spends a bit more time in that airflow. Because these thin rads are a little more restrictive to water flow (half the tubes remember), you would need a pump with a good head (pressure) rating esp if you are gonna push the coolant through more than a single CPU waterblock. You would want to have a slightly lower water flow through them so the coolant spends a bit more time in that airflow. Most of what you said I agree with, but this stands out as being plain wrong to me. The water flows at the same rate through the entire loop, so if you are running at a lower flow rate, sure the water will cool down more as it passes across the radiator, but it will also heat up more as it spends more time in your blocks. For ALL loops, the best cooling results are obtained when the flow rate is so high that you have no perceptible drop in temperature across your radiators, and also no perceptible rise in temperature across your blocks. At this point you have reached a steady state where all the coolant in your loop is at roughly the same temperature, and the loop is operating at it's greatest efficiency. If you have a very high flow rate, you may not see any deterioration by lowering flow, but you certainly will if you lower flow too much. There is no circumstance under which your loop, any loop, becomes MORE effective by lowering flow. A little bit, but less than you'd think. There are serious diminishing returns by making a radiator thicker. The air warms up as it passes through a radiator, and if your radiator is thick enough, the air gets so warm as it is passing through, that it is not very effective at cooling down the water any further. I have one of those crazy 85mm thick Alphacool Monsta 280 radiators in the front of my case, but honestly, I don't think it's really performing much better than a 45mm radiator would, and certainly not better than a 65mm one. LOL top push air thru that 85mm rad you would need some equally monstrous air pressure. That too, but the fin density isn't extremely high, and I do use relatively high static pressure fans in a push/pull configuration. I'm thinking I'm limited more by temperature difference (essentially the first half of the radiator warms up the air so much that the back half doesn't benefit it much because the air is the same temp as the coolant) than I am by airflow. Knowing what I know today, I wouldn't have wasted money (and time custom mounting it) and instead gone with a thinner rad, but this was my first build, so I took a "bigger is better" approach. Personally I stick to single-core rads meself. I've used Black Ice Extremes (the extreme is their dual core rad) in the past and to be honest I didn't find it helped an awful lot unless I put the fans as push/pull - kinda defeats the purpose of silent computing. The bright red B.I. Nemesis I'll be using in my upcoming LC setup is a single core, sparse-fin one that actually gets some pretty good results over others such as the slightly thicker/denser-finned XSPC EX360 using cheaper, less pressure-mad fans. I generally find push-pull to be quieter than single fans, because you can get the same amount of airflow with lower RPM's and thus less cavitation. Takes way more space though. 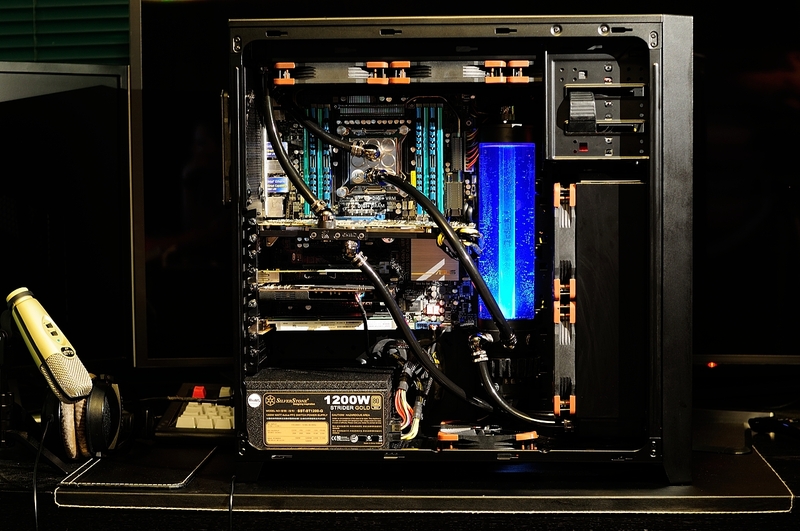 In my Corsair 750D I could fit my massive Monsta 280 radiator up front with 140MM Noctua iPPC fans in push-pull (by drilling custom screw holes in the case) but my xt45 420mm up top just barely fit with a single row of fans. cyberguyz, Hakaba and ccityinstaller like this. If you are curious, I did a build log here when I first put it together a couple of years ago.